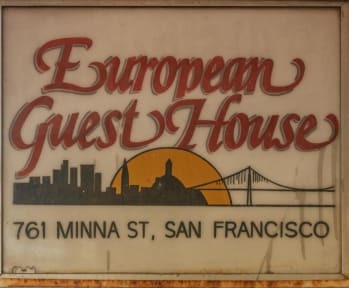 European Hostel kohteessa San Francisco, Yhdysvallat: Varaa nyt! For group bookings, any modifications/cancellation need to be done no later than 2 weeks prior to arrival date. The following group types are not accepted by this hostel: Junior / Primary School, Stag/Hen/Bachelor Party, Cultural Group If you have misrepresented the type of group you are booking for, your booking may be cancelled by the hostel." Great Location-Close to Greyhound and BART transit. Affordable rates for Private rooms and dorm Beds with 4 and 6 per room. Centrally located closer to downtown. Only couple blocks to Union Square and all the shopping malls and restaurants. Convenient location for transportation including the subway and bus stops. Less than 5 minutes walking distance to the Asian Art Museum, the City Hall and the Symphony Hall and many more locations. We are walking distance to the Bus, Train and direct BART run to the airport. This means you can arrive here from the airport for 1/2 the cost of a shuttle. Close by to major attractions and public transportation. Within walking distance to Cable Cars, Union Square, City Hall, Convention Center, Fisherman's Wharf, San Francisco Visitor's Bureau and Chinatown. Street parking available for free but limited to city rules and regulations. Parking garages available at walking distance. Private Rooms can be rented by any adult, with proper ID and credit card. Dorm beds require a passport or student ID from out of local area. All Dorm rooms are available for travelers and students only. you must provide ID OUT of San Francisco area and proven travel itinerary. Males over age 30 cannot occupy a dorm bed. No occupancy over 21 days is allowed. The local city tax of San Francisco (16.25%) is not included in your rates and it's due at check in. Cancellations must be done 48 hours in advance by 1pm directly to the hostel. Our Cancellation Policy for Groups is 2 weeks. Only problem is that I didn't read the reviews of other visitors...will do in the future!